Meet the New SnapStream Express. At $499, it's the smallest SnapStream appliance ever. You get all the power of SnapStream's TV recording, search and Twitter and Facebook integration, in a compact, affordable package. SnapStream Express paves the way for more users to get their hands on SnapStream. 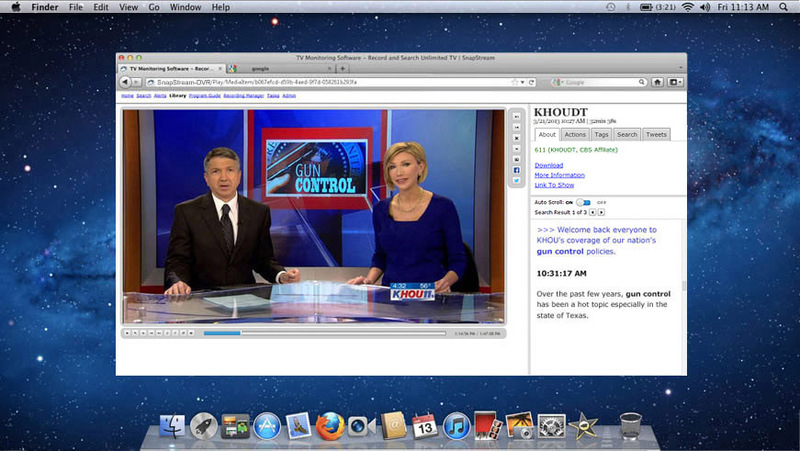 Everyone can record and search TV like "The Daily Show" and "Last Week Tonight." Be it a single TV show with a social media initiative, a TV-focused journalist, or any organization using DVRs or TiVos. We got an awesome write-up about the SnapStream Express launch on Ars Technica. 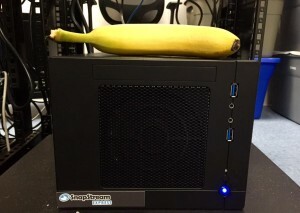 And oh, here's a #BananaForScale, to show the svelte form factor of SnapStream Express. Which SnapStream is Right For You? Considering the SnapStream Small Business Edition (SBE) starts at $10,000, SnapStream Express delivers a new entry-level option that's easy to budget for, manage and deploy. We're happy to consult on the best SnapStream option for you. 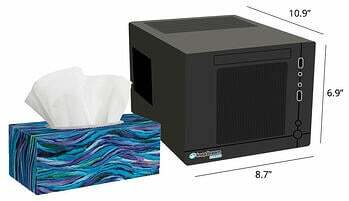 Drop us a line at sales@snapstream.com or 1-877-762-7787. *SnapStream Express has the same feature set as the Small Business Edition. This includes capabilities like TV recording, search, unlimited clips, cloud sharing, file export, social media integration and more. This excludes SmartChapters and Clustering, and limits ShowSqueeze to clips only. Maximum of 5 user licenses. Hi, everyone! 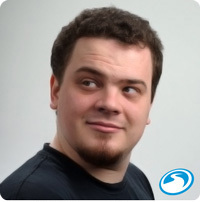 My name is Mike Speriosu and I was the main developer of a set of TV search improvements in SnapStream 6.1 that involve language. I recently finished my doctorate at the University of Texas at Austin where I worked on problems at the intersection of human language and computer science, and was lucky enough to join the SnapStream development team a few months ago. Products like SnapStream are part of an ongoing trend in technology to help people interact with each other and with computers using their most advanced and expressive mode of communication: language. After working on a variety of linguistic and software problems in academia, I was very eager to apply my skills to a real-life product that could benefit from more linguistic intelligence. 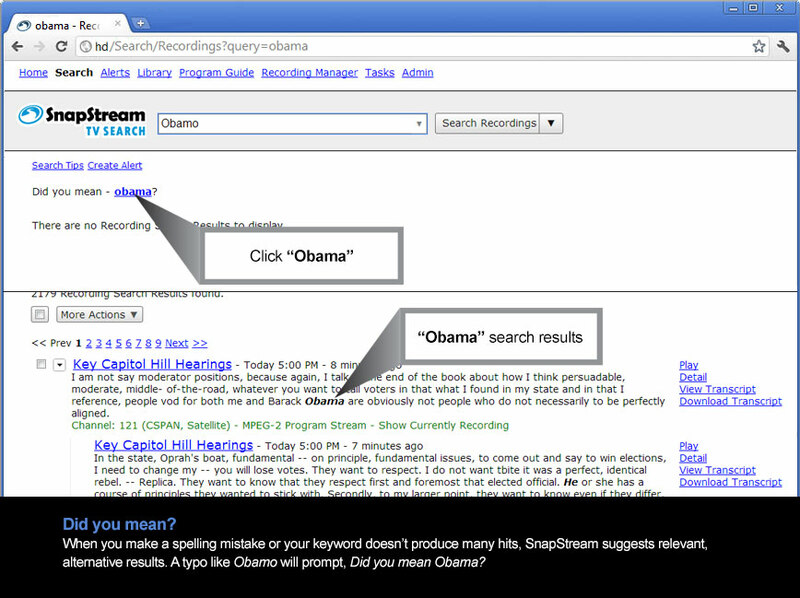 One of the most compelling features of SnapStream's TV media monitoring technology has always been its ability to search recordings and send alerts based on what’s said on TV, and now recording and searching closed caption data work better than ever. A lot of the closed caption (CC) text that initially comes through with the video and audio signal is messy in various ways. Many CCs are in all caps or just capitalized oddly, so at least some degree of re-capitalization is necessary before we show and save the text, in order to be easily readable. Previously, we essentially lowercased everything except the first letter of every sentence. We now use a combination of algorithms and dictionaries to be smarter about what should be capitalized. Names of people, places, companies, and more are now often properly capitalized. Another problem with CC text is that it sometimes contains misspellings. We now use a dictionary and statistical model to detect when we think a word is misspelled, and automatically correct the spelling when we have high confidence that our fix is correct. We took special care not to make this feature too aggressive, because we know how annoying automatic corrections can be when they’re wrong. Making a valid correction, however, could be the difference between getting a relevant alert and not getting it. To give SnapStream customers more control over these CC-altering features, we've included a custom dictionary where administrators can specify their own words and phrases that they want capitalized a certain way. We’ll never attempt to change the spelling of words in this custom dictionary. We’re trying out these advanced CC-altering features on English text only, with plans to expand to other languages in the future. In the meantime, we have an algorithm that ensures incoming CCs are English before applying the features, so that your favorite Spanish or French shows don’t have their spelling corrected as if they’re English. 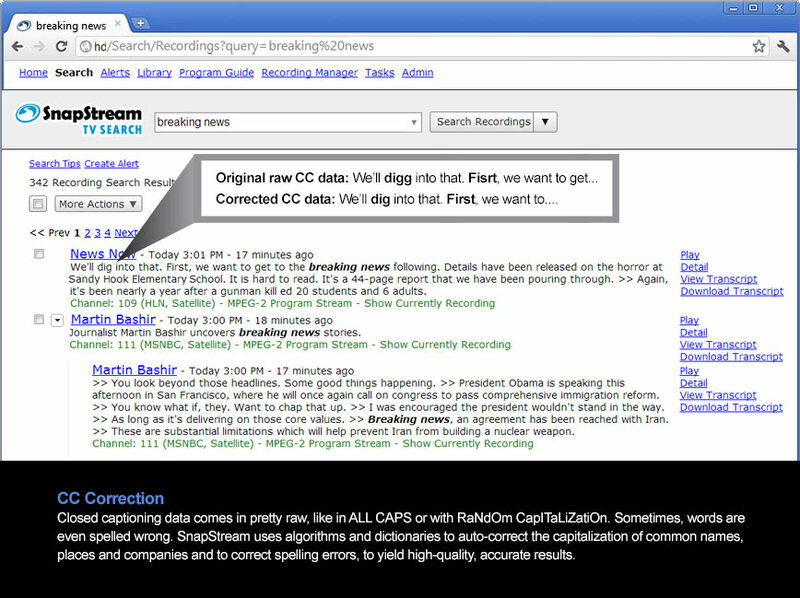 When you searched in previous versions of SnapStream, you would sometimes get suggestions in the form of Did you mean ____? but the quality of these suggestions left a lot to be desired. Our suggestion engine now takes into account the statistical properties of your entire library of recordings, resulting in much more useful suggestions. We also now have the ability to give suggestions when searching the program guide, something that was absent from past releases. Another improvement we’ve made to search makes it so that suffixes like -s, -ing, -ed, and so on do not affect whether a word counts as a match for your search term. 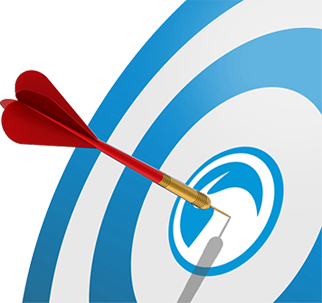 For example, searching for campaign will now match recordings that mentioned campaign, campaigns, campaigned, and campaigning, giving you more relevant results with less effort. We’ve also added some lists of synonyms to our search engine, so that searching for big will also match large, and similarly for many other words. We made an effort only to make such connections between words that really do mean the same thing the vast majority of the time. SnapStream returns results for pronouns like he, she, and I that likely refer to the same person named in a search, e.g. 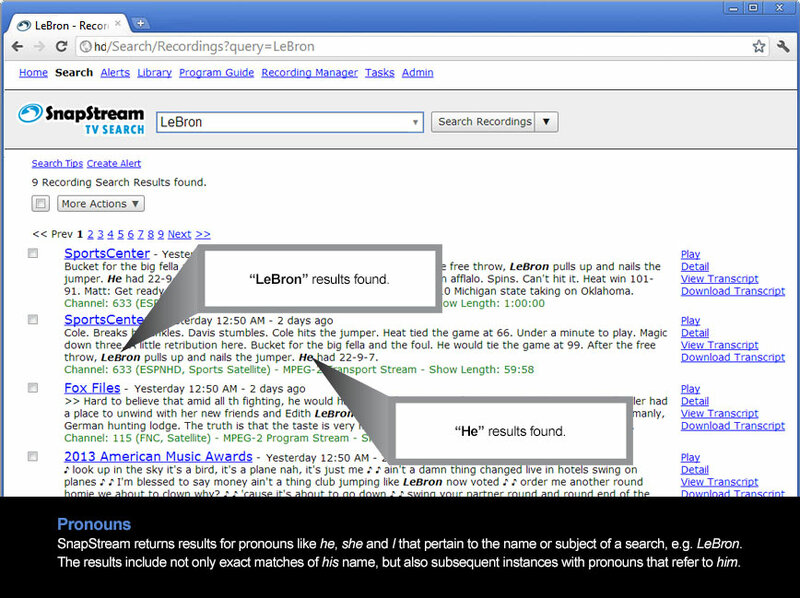 Lebron, in addition to exact matches on the name itself. Pronouns are allowed to match names for up to about one minute after the name is mentioned. 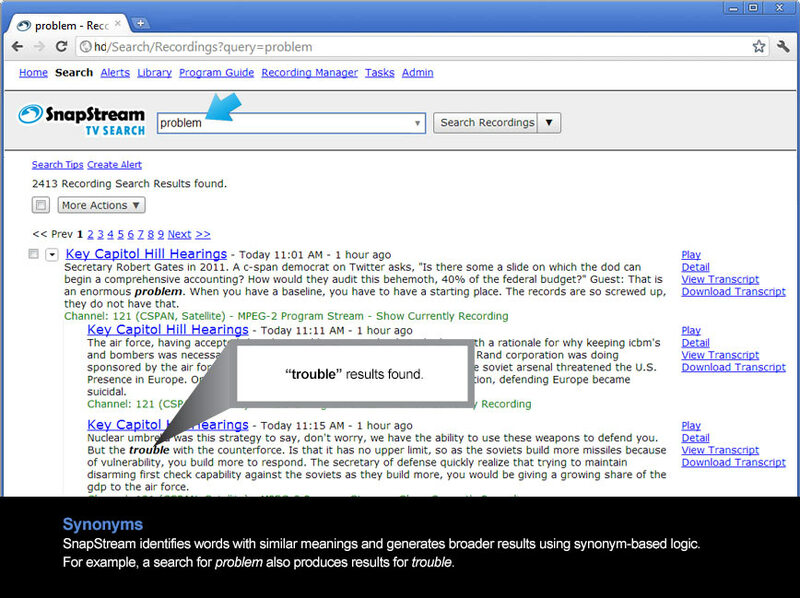 We hope this feature makes it even easier to find relevant information in your recordings without spending a long time refining your search query. Finally, we've made it so SnapStream recognizes accents and other special characters and treats them alike, so you don't have to worry about exact spelling in your searches to return all possible matches. If you search for entree, you'll get hits for both entree and entrée. And if you search for entrée, you'll get hits for both entrée and entree. We added these features with the intent of making recording and searching just work better, even if you don’t always notice the new feature that kicked in and just made your life easier. We appreciate software that simply works, and hope we’ve achieved that goal with this update! Mike Speriosu received Bachelor's degrees in Computer Science and Linguistics from Stanford University and a Master's and PhD in Linguistics from the University of Texas at Austin. He has published work in computational linguistics and done consulting in software development for companies looking to beef up the linguistic intelligence of their products. He is now on the development team at SnapStream. By human nature, we all love new things: The rush of adopting the latest technology. The smell of a new car. The opening night at the movies. The excitement of a new release of SnapStream. 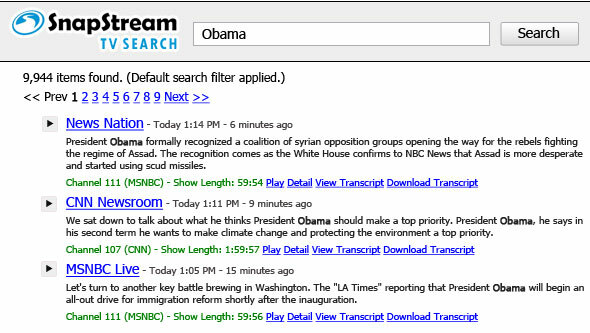 A new user-level setting allows you to auto-collapse search results by TV show, creating a macro view of all mentions. 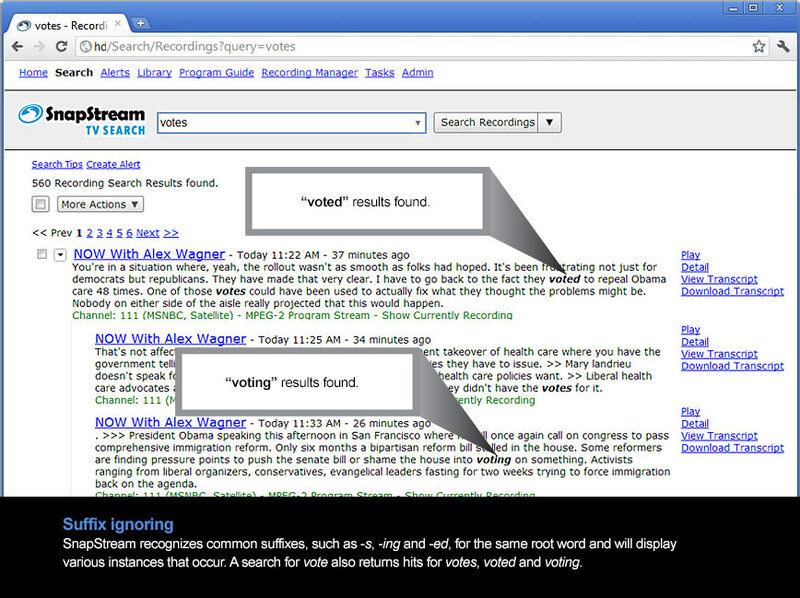 In this example, the results are collapsed by TV show, displaying an overview of where the search term Obama appears. Click the arrows to expand the results. Alternatively, you can opt to display the results in the expanded view, so it's easier to see every individual mention within every show. 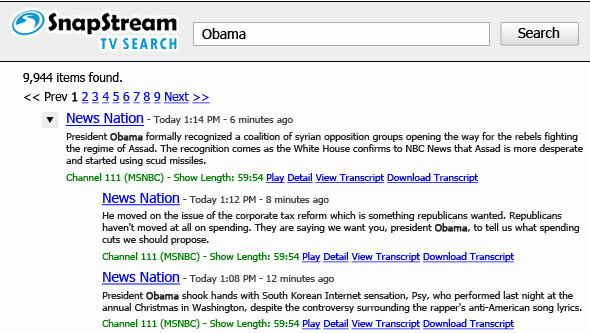 In this example, SnapStream drills into the first result, News Nation, to identify every mention of the search term Obama in that program. 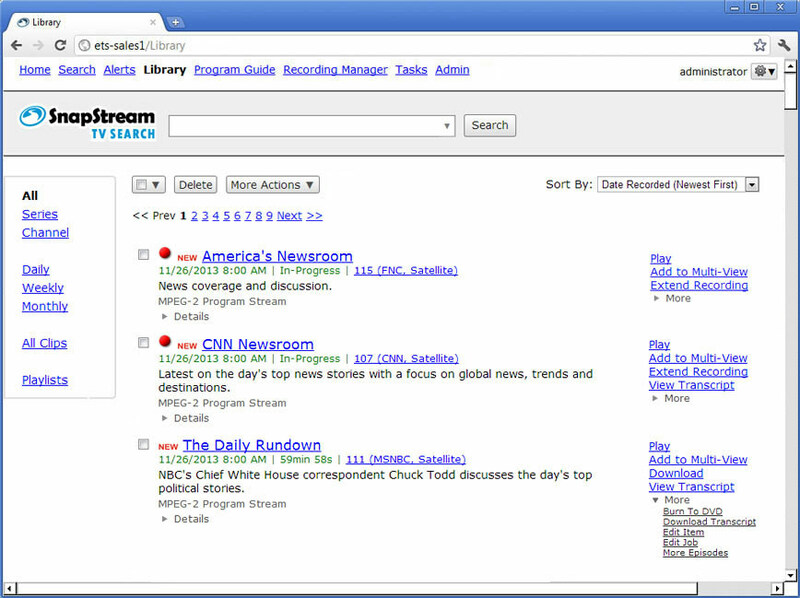 At the user level, save a default search filter to refine the displayed TV search results. For example, you could exclude clips or ShowSqueezed files from showing up in your searches. 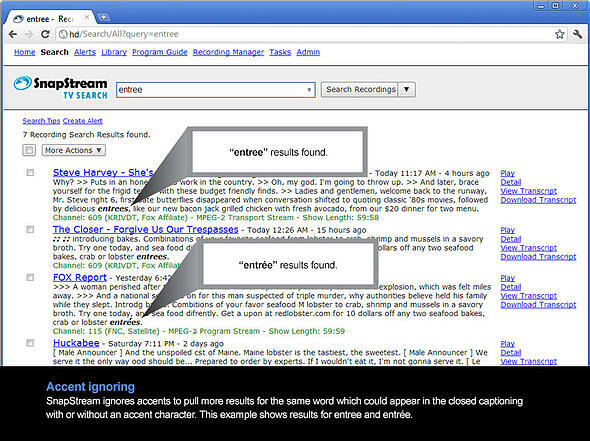 Combine any of SnapStream's search filters, such as DATE, CATEGORY, CHANNEL, TITLE, FILE TYPE, etc. See the help file for a complete list. 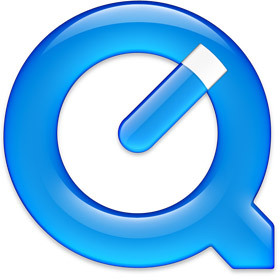 In addition to the H.264 and WMV codecs, ShowSqueeze supports the QuickTime format (.mov). We recommend transcoding to reduce file sizes, which thereby increases archive depth. ShowSqueeze Finished - Initiate a Workflow once a transcode completes. 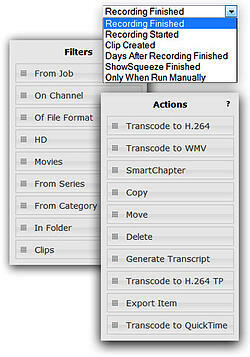 Only When Run Manually - Create Workflows to run on demand, from the TV Library, as a series of saved actions. Clips - Create Workflows that only apply to files that are clips. 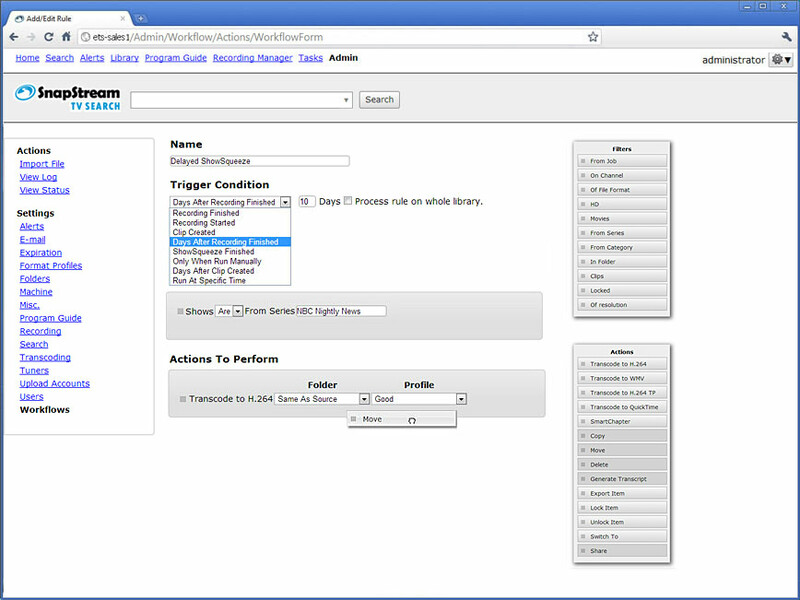 Export Item - Export a copy of a TV file outside of SnapStream's environment, with the option to include or exclude closed captioning. 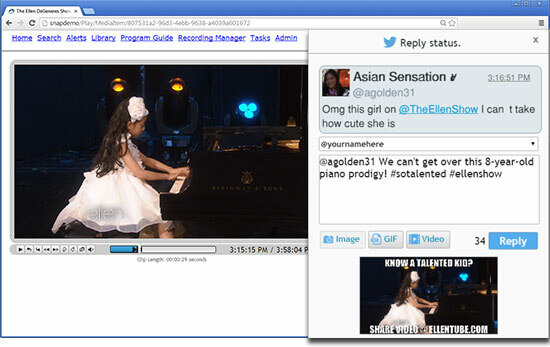 For instance, export clips to a third-party transcoding application. Transcode to QuickTime - As explained above in #3. 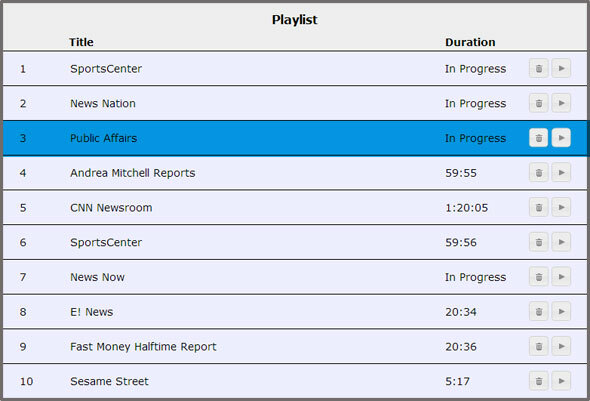 In 5.7, we introduce a new alternative for recording multiple segments of a channel, throughout the day. 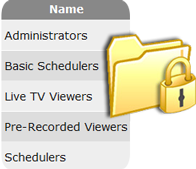 Once you select the time period and the channel desired, SnapStream will display all of the upcoming programs to be recorded during that time, in relation to the latest program guide data. 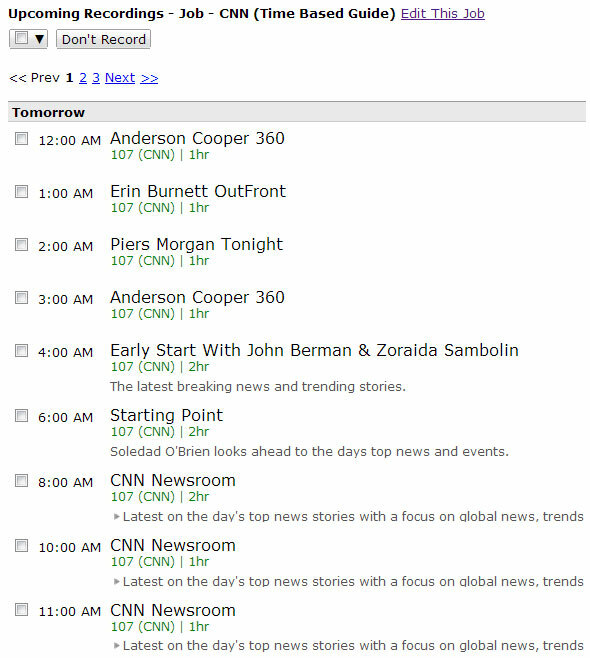 Here's a time-based guide recording on CNN from 12 a.m. to 12 p.m. 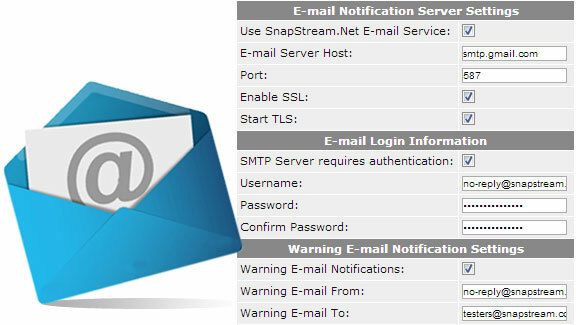 In 5.7, SnapStream.net takes over all email service responsibilities, to remove the administrative step of setting up SMTP. Important features like TV Alerts and system notifications work without any pre-configuration. Manage SDI playout with controls to pause, seek and stop. Edit the playlist to remove or reorder recordings. Ready to upgrade to 5.7? New release! SnapStream 5.6 has arrived. 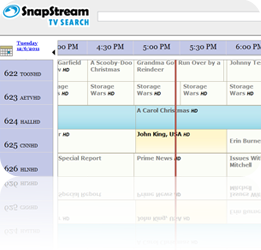 In the newest release of SnapStream, we added new features and made core improvements to deliver the strongest and most reliable TV search experience, yet. + We added muscle to our Mac version. 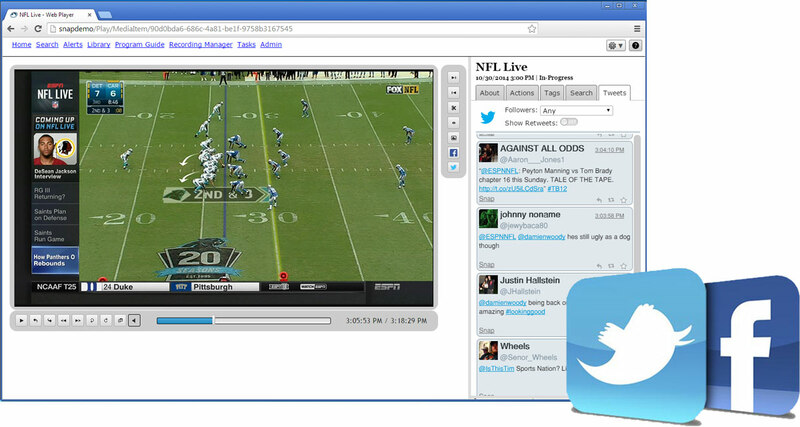 The Web Player for Mac supports viewing of in-progress TV recordings, which is a game-changer for TV monitoring on OS X. 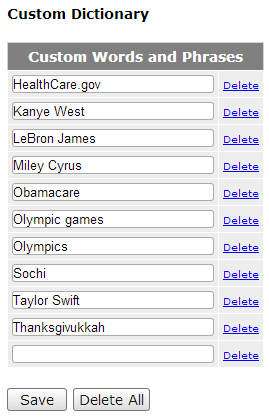 + We added more options for Workflows. You can delay tasks, like ShowSqueeze, to occur a certain number of days later. This is what we call a new trigger in Workflows. + We remodeled the TV Library. 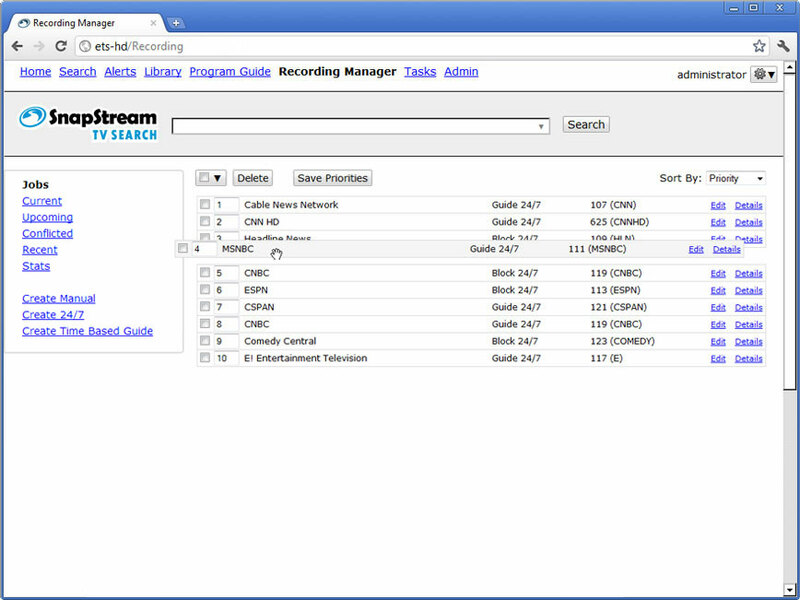 You can sort recordings by date and channel to locate and play the content you want much faster. + We improved how you set Recording Priorities. You can drag and drop your job priorities on the fly, to make quick changes. + We made things more speedy, in general. Enjoy faster page loads and fewer clicks to get to your common tasks. + We make it easy to upgrade. 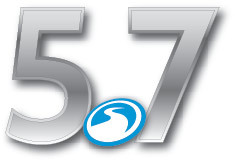 Contact SnapStream's expert support team to schedule your upgrade to 5.6. See what else is new in version 5. + We love new users. Contact our Sales Engineers to get started with SnapStream today. Today marks a new season, the first day of summer, and also the release of a new version of SnapStream. Yippee! In case you forgot, software upgrades are always free for current customers, so get in touch with our support team and we'll hook you up. - Search TV up to 4X faster in the Web interface—from when you initially conduct a search to the individual page loads of your search results. 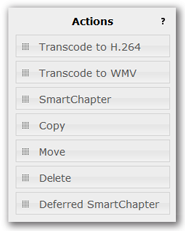 - Transcode to H.264 in half the time. 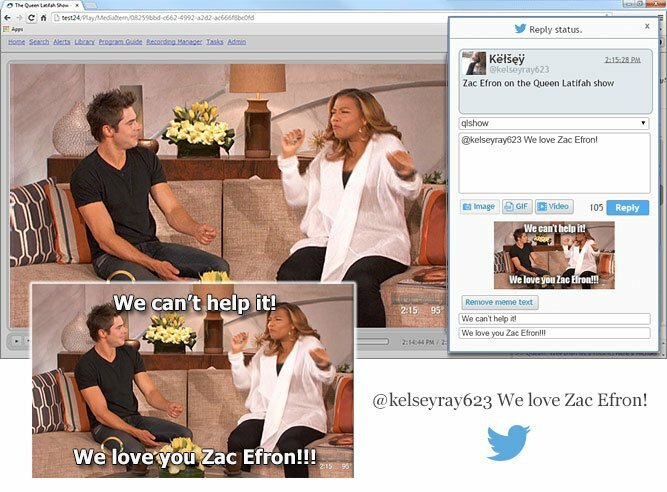 - Play back H.264 from the Mac Web Player. 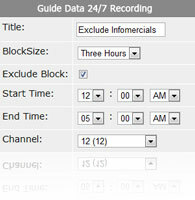 - Record any digital channel 24/7 with seamless transitions between recording blocks. - Use the new clip status box to track and play your clip faster. - IR blast sub-channels when using ATSC/QAM converter boxes. Curious about other improvements and bug fixes? Check the 5.5.1 release notes. Also, if you're currently on version 4, you'll want to explore the gamut of new features available in version 5. 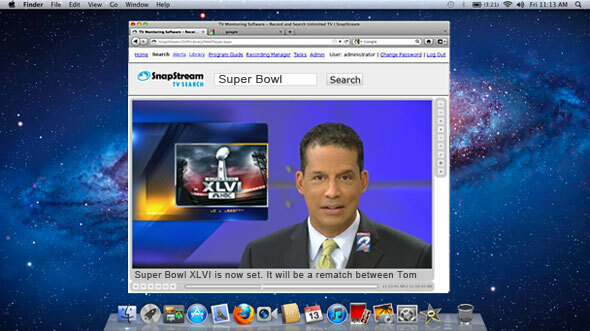 SnapStream's newly released Mac Web Player opens up the world of TV search to Mac users for the very first time. As we hoped it would, the announcement of Mac support generated tons of excitement and fanfare on Engadget, GigaOm and a bunch of other places. Today, it gets even better. We are releasing 5.4.2, which carries support for HD video playback on Mac OS X. Woohoo! So now you can enjoy the crisp resolution of high-definition television as you search, play and clip content from your Mac, connected to your SnapStream HD. Version 5.4.2 also features increased stability for the Mac Web Player and the ability to load guide data from offline sources, if you're so inclined. While HDTV monitoring is a nice luxury for some, for others it is absolutely necessary. For instance, when repurposing TV content, it's HD for the win. For SnapStream users who work heavily in Final Cut Pro, in Mac environments, this one's for you. Seamless Mac HD support is bringing you a big workflow boost! Hey Windows users, we haven't forgotten about you! In addition to the new features we highlighted here, every SnapStream release rolls out fixes and improvements meant to refine your user experience. So, it's usually a good idea to update to the latest version of SnapStream. Check out our release notes for the specifics. SnapStream users, contact our support team to see about scheduling your free upgrade to version 5.4.2. Not searching TV, yet? Give our sales engineers a holler to get started today. Finally, SnapStream supports Mac OS X! Apple fans, today is your day. After over a decade of developing software for Windows, SnapStream is thrilled to announce the all-new Web Player for Mac OS X. This is the big cherry on top of Fifth Generation SnapStream, which has brought you scalability with clustering, Workflows, and tons of other new features and upgrades. With the new release of 5.4.1, Mac users can now experience TV search in their native environments, for the very first time. 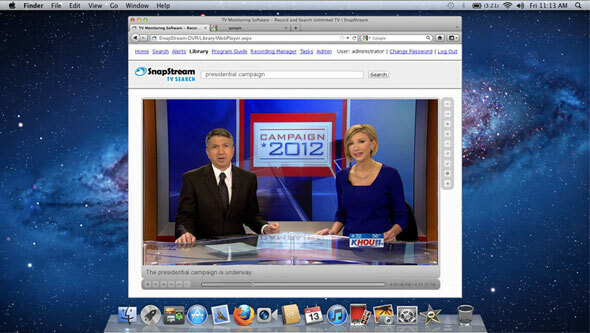 SnapStream's Mac Web Player is essentially a custom plug-in that we created to fit within the primary Web interface. 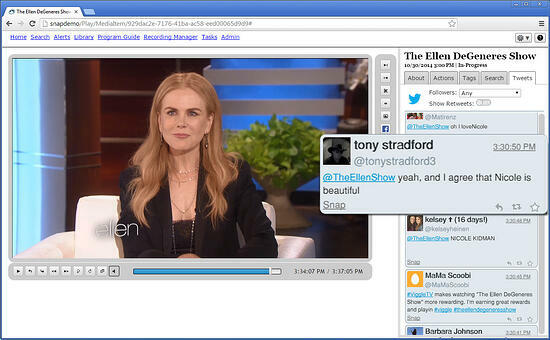 It plays back SnapStream's native MPEG-2 TV recordings in Mozilla Firefox 8 and above, and runs on Mac OS X 10.6.3 and above (which corresponds to anything after Snow Leopard). Optimize video formats for e-mail, iPads, iPhones, and more! Exclude Time From 24/7 Blocks New! For example, you may want to exclude infomercials that typically air from midnight to 5 a.m. There are a few criteria to meet before we can begin your upgrade. Contact SnapStream's Support Team to discuss your eligibility and options. E-mail support@snapstream.com or call 1-877-696-3674 between 9 a.m. and 5 p.m. EST, Monday through Friday.